'Zootropolis' or 'Zootopia' depending where you are in the world is the latest movie to come from animation juggernauts Disney. 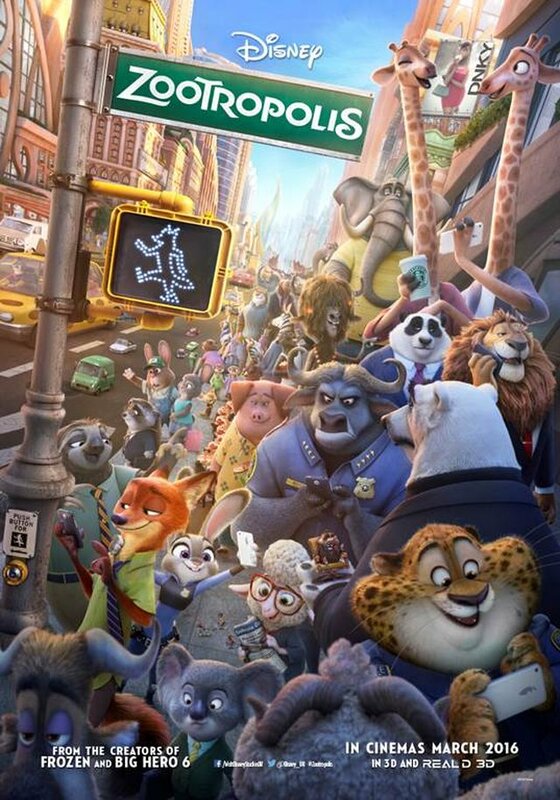 'Zootropolis' is set in a world completely inhabited by animals and more precisely a large city with the tittle name. This concept has worked for Disney in the past but would 'Zootropolis' continue that run of form? The city of Zootropolis is home to mammals of all sizes from enormous elephants to the smallest shrews. Predators and prey now live together in perfect harmony. The city has a new police officer in Judy Hopps (Ginnifer Goodwin), the first ever rabbit to be a cop. Instantly she isn't given any help from her new colleagues and nobody believes in her true ability. However, when some predators start to go missing, it is questioned if the predators can be trusted. Judy offers her services to look for a missing otter but she has a time limit. If she fails, she loses her job. To do this she will require the help of Nick Wilde (Jason Bateman), a cunning and sly fox. An odd pairing will need to leave their differences a side in order to crack the case for Zootropolis' sake. Now most of the time when a Disney film or any animated film comes out, a lot of people will dismiss it claiming it to be only for children. To be fair there are a lot that will come out solely for children's entertainment. However you also have the films like Inside Out that albeit animated are arguably just as suited for adults due to the story lines and key messages throughout. Zootropolis most definitely stands in the latter category. There's no doubt that kid will be entertained by this but adults will also appreciate it's humour and it's maturity in its story. The film tackles an issue that is very clear to see in today's society. That issue being discrimination. The predators are discriminated in this due to actions of a small selection of predators. Now with the recent attacks in Paris and Brussels, how similar does this seem to real life right now? With a lot of innocent people being blamed for actions of certain lunatics all due to ones race, nationality or beliefs. The film reflects the real world pretty perfectly and is brave to tackle this issue. It is also very important to be teaching kids from a young age that this is not ok and shouldn't be done. By teaching them this at a young age is vital as in essence, it will be creating a better world for tomorrow. That's not the only message within the film. Judy Hopps is shown to have wanted to have been a police officer since she was a little girl and from day one was always told that she wouldn't make it. However she never once gave up on her dreams and continued to work her way to reach her goals. Another great message for the audience both young and older: you can do anything you want and don't let anybody tell you otherwise. What a great message for children especially as they may look at the character Judy as being much smaller but won't let anything stand in the way of her dreams. The will and determination from Judy when everyone was against her shows that anything is possible if you really want it. Now what Disney have done phenomenally well is combining these deeper messages with fantastic humour. The movie is laugh out loud funny which is something a lot of comedies this year have actually struggled to do. There are many times where both children and adults will find hilarious showing a brilliant mix of humour for all ages to enjoy. There are some surprises throughout the movie that really hit and will make you laugh out loud. 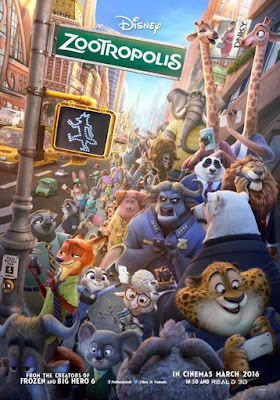 Particularly funny moments for myself involved the Fennec fox looking animal as well as the incredibly funny sloths I cannot fault the comedy at all in 'Zootropolis', some truly great work from the writers. The film is thoroughly entertaining throughout the run time and I can't see why anybody would get bored from watching this film. This is mainly down to how well the two leads play off one another in 'Zootropolis'. The unusual pairing are great to watch as they bicker constantly at the start of their partnership. As the duo grow closer and learn more about each other, they become a very efficient and entertaining team. Credit has to go to both of the voice actors Ginnifer Goodwin and Jason Bateman. Goodwin was perfect as the sweet innocent little bunny who just wanted to make a difference. She was fantastic as Judy and worked perfectly alongside Bateman's Nick Wilde. Speaking of Bateman, the casting for him to be the clever fox really is one of the best choices for an animated character. He provided the wit that was vital for the character and was magnificent throughout. The chemistry between the two worked perfectly to delight of all the viewers. It was also fantastic to see a world completely inhabited by animals as if they were humans. It was great seeing all the different aspects of the worlds due to the specific regions such as Tundra Town or in the Rainforest District. Some regions were more exploited than the others which may of been done to leave other areas to explore further in potential sequels. I would've liked to have seen more of the different areas but I can see why possibly they have limited it for now. It was still great seeing how many different animals would go around day to day life such as how transport would work for many different creatures. This lead to some highly entertaining short scenes that worked to great effect. A fantastic animated movie from Disney that is both hilarious and tackles some serious issues in the world today. A must see for everybody. So have you seen Zootropolis? If so what did you think of it? If you plan on going to see it, I hope this review has helped you choose to see it and hope that you enjoy this movie as much as I did! Once again thank you for reading my review, it is much appreciated!